Slots are the most popular genre of casino games. Many consider slots to be more fun and exciting than other casino games due to the bonus rounds, creative themes, and chance of a large win off a small bet. Unfortunately slots are one of the worst mathematical bets in online casinos with a typical house edge of 3-6%. Nevertheless, slots-only bonuses can be significantly EV+ and worthwhile. 3-Reel Slots -- As the name implies, 3-reel slots have 3 reels. If the reels line up according to the listed paytable, you get the corresponding payout. The maximum payout often requires betting maximum coins (usually 3). There are many variations. Some 3-reel slots also have bonus rounds. If a certain symbol or combination of symbols appears, you enter a separate screen where you have the chance of a large win. You may have to pick a box, spin a wheel, or simply click a button. Video Slots -- Standard video slots have 3 rows and 5 reels, for a total of 15 symbols. If you get 3 or more matching symbols, you receive the corresponding win. Wins usually pay from left to right, meaning 3 matching symbols in the first 3 reels is a win, but 3 matching symbols in the final three reels is not. Video slots often have many lines of winning sequences. Line 1 to 3 are the lines of the three rows. Line 4 might be a diagonal sequence including reel 1 row 1, reel 2 row 2, reel 3 row 3, reel 4 row 2, and reel 5 row 1. There are 243 possible lines, but it is rare for more than 25 lines to be available. You can select 1 line, 25 lines, or any number in between. Each line represents a separate bet, so a 25-line bet is 25x larger than a 1-line bet. Video slots may offer free spins and/or bonus rounds. Free spins are usually triggered by 3 or more scatter symbols. These scatters do not need to be on a winning line. They can be anywhere on the reels. If you get the scatters, the reels will spin on their own for a specified number of spins, usually 10-30. Wins may be doubled or tripled during the free spins, so much of the slot's overall payout may be in the free spins. Bonus rounds triggers vary. Like 3-reel slots, bonus rounds involve separate screen where you have the chance of a large win. Fruit Machines -- Fruit machines refers to a type of European (often UK) 3-reel slots. The games usually have a variety of features, such as trails and nudges. Unlike other types of slots, there may be some strategy involved. Outcomes of fruit machines often have some non-random elements. True fruit machines are not common online, although Microgaming offers some AWP games. Most slots do not have strategy-related decisions. Simply spin and see if you have won or not. One aspect if slot play that is under your control is variance. Using two-tier betting and starting with high variance bets can dramatcially increase return when playing with pre-wager bonuses. Two-tier betting makes most pre-wager slot bonuses EV+ and greatly increases the number of worthwhile bonuses. See the slot bonuses page for more detail. Another relevant aspect of strategy is when to play the double game. 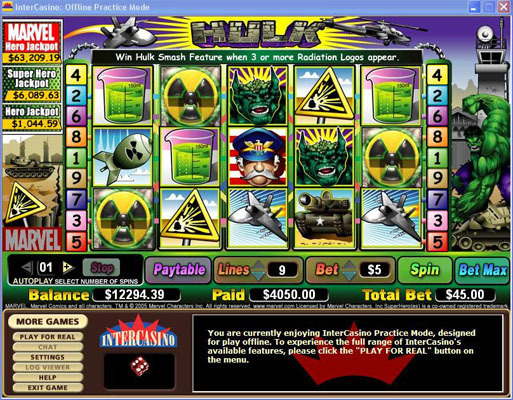 After a spin is completed, some casino softwares give you the opportunity to double your win in a war-like game. The dealer and player both draw a card. If the player's card is higher, the win is doubled. If the dealer's card is higher, the player wins nothing. If the player and dealer tie, the original win is returned. You can double sequentially until reaching the maximum win. This double bet usually has no edge. If doubling counts towards the wagering requirement, it can be used to dramatically reduce the expected loss per unit wagered. The double bet can also be used to increase or decrease varaiance, depending on the size of the double. If you want to avoid increasing variance, do not double when the size of the double bet is greater than that the variance per slot spin (square of SD per slot spin). Note that video poker doubles may be restricted in the T&C. The game may not count towards wagering or may be banned alltogether when playing a bonus. Most online slots payout 94-97%, resulting in a house edge of 3-6%. This is roughly half the house edge of typical land-based slots. More specific information about individual softwares is below. Cryptologic-- Virgin lists payout information for a portion of Cryptologic slots, as quoted below. The house edge values listed at Virgin range from 4 to 9%, with an average payout near 5.5%. Audit reports at Cryptologic casinos suggest a slightly lower average payout of 6-7%. This difference may relate to the specific game selection at Virgin. Microgaming -- Microgaming casinos print audit reports each month, showing the net payout of their slot games. The average slot payout data for several Microgaming casinos for the years 2001 to 2008 is listed below. Based on this data, I expect that the average payout of Microgaming slots is ~95.8%. The payout of specific slots varies from one game to the next. Payout data collected for over 100 slots suggests all Microgaming video slots without strategy decisions or progressive jackpots have a house edge between 3 and 5%. Known house edge data goes very close to these 3% and 5% limits with Big Top / Carnaval at 3.06% and Astronomical at 4.95%. This suggests the limits are not a coincidence and are instead a rule Microgaming uses when creating slots. Progressives probably likely fall in this range, as suggested by Virgin's listed 4.88% Mega Moolah hous edge. Redbet's >5% house edge progressive payouts and being exactly 7.00% off from Virgin likely relates to not including the progressive jackpot in their listed payout data. The payout data for 2001 & 2002 listed above suggests that older classic 3-reel games may have a higher house edge than more recent video slot games and the ~95.8% average payout listed above. Or it may simply be variance due to a smaller number of samples. The house edge of older 3-reel games often varies depending on the number of coins selected. The maximum number of coins may be required to get the maximum jackpot and/or a high payout bonus round, resulting in the lowest house edge. A list of slots ranked from highest to lowest payout is below. The numbers in parenthesis refer to the number sources mentioned that list that figure. These sources include Betway, Redbet, Virgin, and calculated data based on the slot reels. Payouts that are an even integer are probably rounded, rather than precise values. The highest payout of 97.5% occurs in Hot Ink and Retro Reels: Extreme Heat. These games have a re-spin feature where the player may re-spin 1 of the 5 reels after the original spin has completed. The re-spin cost is chosen, such that the maximum re-spin payout is 97.5%. As such, the payout without re-spins is lower. In Retro Reels: Extreme Heat, I calculated a maximum payout of 97.5% with re-spins and 96.65% without. More detail is in this forum thread. Playtech -- Playtech slots have an extremely wide range of payouts. House edge varies from 0.68% to 9.00%. The lowest house edge slot is Goblin's Cave, which has a 0.68% house edge with the maximum coins and optimal strategy. This is a unique 3-reel slot with a strategy decision. The player gets two spins. After the first spin, the player may choose to hold any of the three columns and then spin again on any columns that are not held. The game is much like video poker, but slot columns are held instead of cards from a poker hand. Other 3-reel spin and hold games tend to have a similar low house edge. For example, Ocean Princess and Ugga Bugga have a house edge of 0.93%. RealTime Gaming -- The house edge of RealTime Gaming slots is configurable by operators. This means the house edge of a specific RealTime Gaming slot may vary from one casino to the next. Old marketing documentation lists two settings as 2.5% and 5%. Operators have posted that there are 3 settings. In 2010 an operator listed the three settings as 2.5%, 5% (default), or 8.5%. Note that game payouts are approximately the selected setting, but the exact payout may vary somewhat from the selected setting. The few RTG casinos the publish payout data fit with the above estimations, generally being at ~95%. Rival -- Rival lists the payout of their games in the game's help page. Slot house edge values are rounded to their nearest 1% in these help files. According to this data, the house edge ranges from 2% on Cosmic Quest Episode Two to 6% on Hole In Won, with most games at 4%. A full list is below. Note that the lowest house edge game, Cosmic Quest Episode Two, is a new release at the time of this update. The house edge may be increased in the future. * If you have two WILD symbols, only hold the third symbol if it is a Bonus or an OrangeBag or higher. * If you have a single WILD and a pair of Bonus or a pair of Plums or better, hold all three symbols, else throw away the low pair. * If you have an ANY award comprised of one Wild and two different Thug symbols, hold the Wild and the highest value Thug. * If you have an ANY award comprised of one Wild and two different Bag symbols, hold the Wild and the highest value Bag. * If you have an ANY award comprised of one Wild and two different Fruit symbols, hold only the Wild. * If you have a winning outcome, you should hold it. This includes the case when you have an ANY award (for example, an Any Fruit outcome such as two Oranges and one Plum). In this case it is best to hold all three. * If you have an exact pair of symbols, even if only a pair of Coins, hold the pair. * If you have two mixed Thug symbols and a third unrelated symbol, hold the mixed Thugs. * If you have two mixed Bag symbols and an unrelated symbol, hold the mixed Bag symbols. * If you have two mixed Fruit symbols, only hold them if the third symbol is less than a PurpleBag, else hold the third symbol. For non-max credit play, the strategy is the almost the same, except you should hold a single BlueBag over a single Bonus symbol. For max credit play, you should hold a single Bonus symbol over a single Blue symbol. Others -- Grand Virtual publishes audit reports listing average slot payouts in the 95-96% range. This makes me believe the house edge of their slots varies from 3-6%, depending on the game. Random Logic audit reports are typically in the 93-94% range, so the house edge of their slots is likely in the 5-8% range. The external site The Pogg lists more detailed information about slot payouts and slot games, including the house edge of specific slots with Playtech software. Slots have a high variance, which can make it difficult to complete a wagering requirement with slot play. You can reduce variance by decreasing bet size, increasing number of lines on video slots, or choosing lower variance machines. Slots that have much of the overall payout in bonus rounds or other rare payouts tend to have the highest variance. The standard deviation per spin figures for the slots in the simulator are below. Note that the standard deviation of the majority of the multi-line video slots is lower than 7 Sultans, which is one of the lowest variance 3-reel slots. While a single line on a 5-reel slot is generally higher variance than a single line on a 3-reel slot, increasing the number of lines can more than compensate for the increased variance per line, so the combined bet over all lines on a 5-reel slot may be lower variance than 3-reel slots. Also note that the majority of the listed slots have a similar variance to 1-play video poker, while Isis and Off The Hook have a higher variance than all table and video poker games. With this high a variance, you may wish to use a non-traditional betting strategy. See the slot bonuses page for more information.